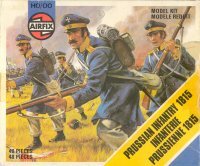 When Airfix finally announced that they would be producing some Prussians for their Waterloo range there was much enthusiasm from customers, but this was tempered with some disappointment when it transpired that they were Landwehr troops rather than regulars. Nonetheless Prussians of any sort were long overdue, and the Landwehr, rapidly raised to increase the size of the Prussian Army, played their part in the campaign of 1815. As it turned out the disappointment was mitigated by the fact that Airfix had made a decent job of the figures. As this set was one of the late arrivals in the Airfix range, it benefited from the years of experience Airfix had gained, and the result is a very nice selection of figures. None of the poses are particularly outstanding, but all are useful and well sculpted. The flag bearer is worthy of special attention as the Landwehr were not issued with flags. This might seem like a real problem except that there is considerable evidence that some units carried a flag despite regulations, and indeed a small number still exist today. Airfix have engraved this rather small example with the standard infantry pattern that is not correct, so we have chosen to paint it like an existing example. The militia were always at the back of the queue when it came to supplies, particularly during the rapid expansion of the army in 1813. By 1815 the situation was better, but still men wore some variety of uniform and carried an assortment of weapons. These figures are in regulation dress of Litewka coat and cap, and as so often with model soldiers are really a bit too smart. In addition, they all have the full regulation infantry pack and equipment, which again was not always the case in such units. Each man has a blanket/greatcoat neatly folded on top of the pack, when in fact it was almost universal practice to wear this rolled over one shoulder where it could also give some small extra protection from sword-cuts. Finally, every man has his bayonet in a scabbard on his left hip. The Landwehr often went without bayonets (sometimes they didn't even have muskets in the early days), and if they were issued then they were usually kept on the musket - only the lucky few had scabbards. A curious observation on this set is that, though everyone has a bayonet, no-one is using it, not even the figures that quite clearly should be such as the charging figure. Landwehr officers were supposed to wear the normal coat with tails of the Line infantry, but many chose to wear the Litewka like the figure in this set. When this set first came out Airfix seemed to be producing good quality figures with effortless ease, and these are certainly very well done. It is just a pity that the desire of manufacturers to portray their subjects in the smartest and best possible uniform means that these figures look lovely but would be something of an ideal which was often not achieved.